Discover a few of the current trends within the kitchen design industry! When you’re starting on a kitchen remodel, it can be difficult to navigate the trends. There are so many renovation trends and styles; from Pinterest to design shows, to Instagram, figuring out what styles will last can be tricky. Fortunately, there are plenty of design trends that have stood the test of time and can be integrated into your remodel without fear of looking dated. 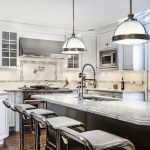 If you need more help navigating what trends will and will not work for your home and lifestyle, the professionals at Rock Tops Fabrications can help guide you, but while you’re brainstorming, here are three kitchen remodel trends that are here to stay. We all want to keep our counters tidy, right? Integrating better storage systems into your designs can help you create a kitchen that works best for you and your family. Deeper drawers, for instance, can help keep clutter put away in its rightful place. Drawers are often more accessible than other cabinetry, which makes them simple to integrate into a highly functional design. If you add additional organizer inserts and pegboard you’ll be way ahead of the clean-chic trend. If you’ve been hitting up Pinterest and Instagram for kitchen inspiration, you’ll likely have noticed that creating a bright, white base is essential for an airy, clean space. Color trends change so often that trying to pick a bold hue in a hard to repaint kitchen can wind up looking dated quickly. Instead, stick to white walls and cabinetry, for a look that will stay fresh and make your space seem larger. By saving your pops of color for accessories, you’ll make rotating them easier. Pro-tip: you are particularly messy in the kitchen, or have small children make sure to choose a paint brand that’s well rated for areas that need extra scrubbing. Multi-level islands are a great example of how quickly trends change–these days you’ll want to stick to a more straightforward, single level style. Not only is a single level easier to install, but it has the added benefit of keeping your kitchen more open and airy. As with the first two trends, the idea is to help keep your kitchen as clean and user-friendly as possible. A single-level island expands your countertop preparation areas without creating any visual interruptions. This entry was posted on Friday, June 1st, 2018 at 1:29 pm. Both comments and pings are currently closed.